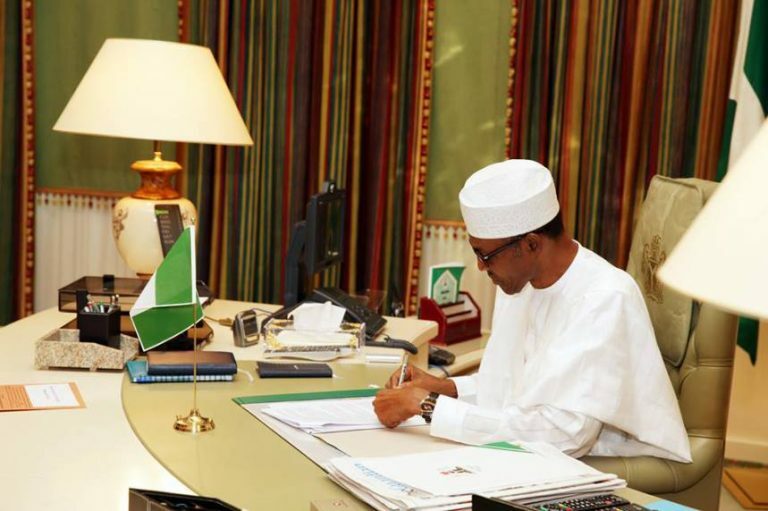 President Muhammadu Buhari has signed into law the N371,532,518,887 Federal Capital Territory (FCT) Appropriation Bill, 2018 and four others passed and transmitted to him by the National Assembly. This was disclosed to State House Correspondents in Abuja on Monday by Presidential Liaison to the National Assembly- Senate, Senator Ita Enang. Enang said President Buhari also assented to the Nigerian Centre For Disease Control And Prevention (Establishment) Act, 2018; the Extradition (Amendment) Act 2018; the National Environmental Standard And Regulations Enforcement Agency (Establishment) (Amendment)Act, 2018 and the Nigerian Institute Of Mining And Geosciences, Jos (Establishment) Act, 2018. The Presidential aide explained that the Nigerian Centre For Disease Control And Prevention (Establishment) Act, 2018 is aimed at promoting, coordinating and facilitating the prevention, detection and Control of Communicable diseases and other public health emergencies in Nigeria. He added that the Act, submitted by Mr President as Executive Bill on October 17, 2017, to the National Assembly is to develop, maintain and coordinate surveillance systems to collect, analyse and interpret data on diseases of public health importance, in order to detect public health threats, guide health intervention and set public health priorities; lead the response to disease outbreaks, public health emergencies and disasters in order to minimize the impact on health; develop and maintain a network of reference and specialized laboratories for pathogen detection, disease surveillance and outbreak response. It is also to develop and maintain guidelines and processes for specimen collection and transportation to reference laboratories including the World Health Organisation (WHO) standard reference laboratories in Nigeria; provide information to the public through multiple platforms on diseases and public health events; and provide support and coordinate the control of national and trans-border responses to mass public health emergencies, such as mass casualties, floods, nuclear, biological and chemical terrorism, disease outbreaks and heavy metals poisoning, among others. The Extradition (Amendment) Act, 2018 now vests jurisdiction on extradition proceedings now on the Federal High Court and no more the Magistrates Court or Magistrates. The amendment further introduces a new section 15(2) preventing double jeopardy as protected by Section 36(9) of the Constitution which prevents a person surrendered to Nigeria in accordance with extraction treaty; obligation from being arrested, detained, extradited or otherwise dealt with in Nigeria or any other country within the Commonwealth or any other country having same extraditing agreement with Nigeria, if the proceedings relate to an offence for which he has been previously convicted or acquitted in the requesting country for which extradition is sought by the Nigerian authorities. The National Environmental Standard and Regulations Enforcement Agency (Establishment) (Amendment) Act, 2018 is an amendment to the 2007 Act and more succinctly defines matters of appointment to the council, empowers the Agency or appropriate person to cause immediate abatement of imminent environmental pollution while appropriate warrant or court order is sought to ensure public safety, among others. The Act also provides for both the public and private sectors alike, laboratory services for rock and mineral identification, sampling and mineral beneficiation, mineral and metallurgical analysis; conduct research in mining, quarrying and related industries; and provide skills training for the artisanal and small-scale mining operators; among others.